BoomFrog wrote: Jahooma's LogicBox seems like it might be really easy for experienced programers but I am totally stuck on level 8 right now. But it's a fun kind of stuck. No hints yet, I'm going to keep chewing on it. Hah, just solved 8 in 2 minutes with a fresh look. Jeezus, I have spent all freaking night on getting Genius on level 19. That thing is *hard*. Finally just barely eked by when I figured out that I could twerk the input string to make the isEmpty? call cheaper. Oh my. That's a logic building knowledge machine thingy. Way cool. Oh, it's also how all programming works, right? Logic gates and processes and all that. It's impressive that the guy behind it actually managed to come up with all these apparently optimal solutions. Coming up with any ole solution isn't *that* hard for most of them, but then it tells you it can be done in half as many boxes and you have to stare at it for ages. I enjoy it thoroughly as a logic puzzle though, as it's really difficult yet it stays in the realm of "I should be able to do this....It's all just a matter of using these, well, logical moves, and not with coming up with some weird meta questions or anything like that.". I haven't actually beaten everything though, lvl 18 as well as a couple of the preceding challenges have thwarted me (although I have tried recently, perhaps I'll go back to it). Ah, yes. I've seen those meta logical puzzels. The problem with those is, while logical the "definitions" of the words and questions either require you to be perfectly like the writer to know what they meant, or to know the intended definition already. Where as mathematical ones generally have no room for mistake in their meanings. I know it was mentioned earlier in the thread, but if you like this LogicBox game you should check out Manufactoria. 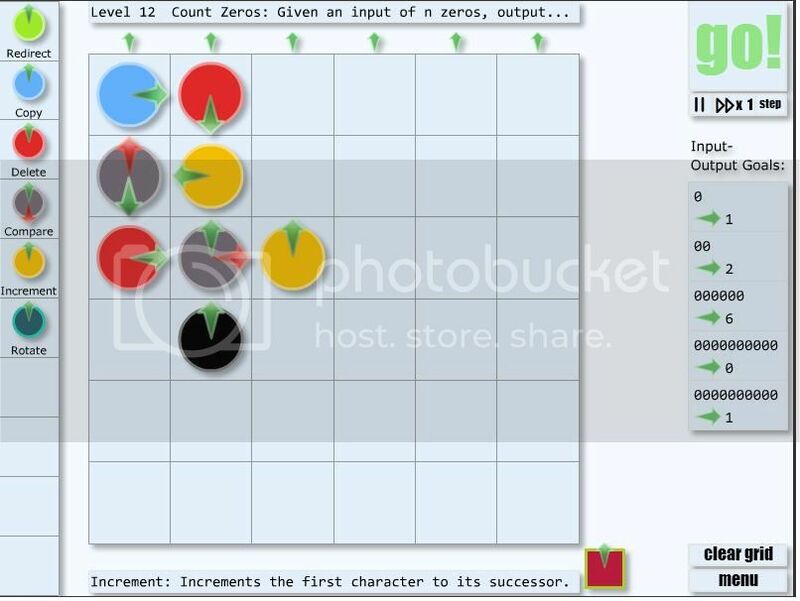 It is a very similar logic/computer science game. Mine has 11 parts, vs 8, but mine's 900 odd steps on the input, and the small one is 1200. It was nice to have both being marked, but the balance is more complicated than its counted atm. A little. I ended up quitting because some little things irritated me. Please please please change the "Undo" button to something that won't set off sticky keys! Also a handy "Reset the level" button would be nice too. I really like the game concept and the levels I played showed you guys get the puzzle design aspect, but some minor user experience (UX) tweaks would really make your game stand out for me. You're definitely right about the undo button, we'll change it later today. There already is a reset button though, namely enter (but we might change that as well). I guess I shouldn't bog down this thread with more posts, but I really appreciate the feedback, it's very helpful! http://www.NexusClash.com is a browser based game which is pretty entertaining. It's one of those persistent grid based multiplayer games, like Urban Dead or Nexus War if you ever played those. You can do what you want, but generally you aim to be either an angel, demon or transcendent, and murder other people. Or you can be boring and heal or craft or what have you. You do have to give an email to sign up for an account and all, and I'm not sure if this is the right place to post and all, but the title of the thread Is cool games on the interweb. Hi, I'm a d*ck that wants to say a symbol. This may have already been posted, but if you enjoy the Submachine series, definitely check out Daymare Town (it's by the same creator). It's like a much more difficult Submachine with a creepier artstyle. I've been playing Crown of Conquest for a while. It's a turn-based RPG with a bit of politics involved - there are towns you can raid and/or become mayor of, and kingdoms controlled by players. You start with a party of max 8 characters and you do the standard roam around dungeons and wilderness doing quests and killing monsters to level up and get gold and items. But you can get additional characters to put in town garrisons or castles you can build, and they'll do the same on their own. I don't know why but I like this game quite a bit. Protip, though - the game is *very* difficult in Classic mode. 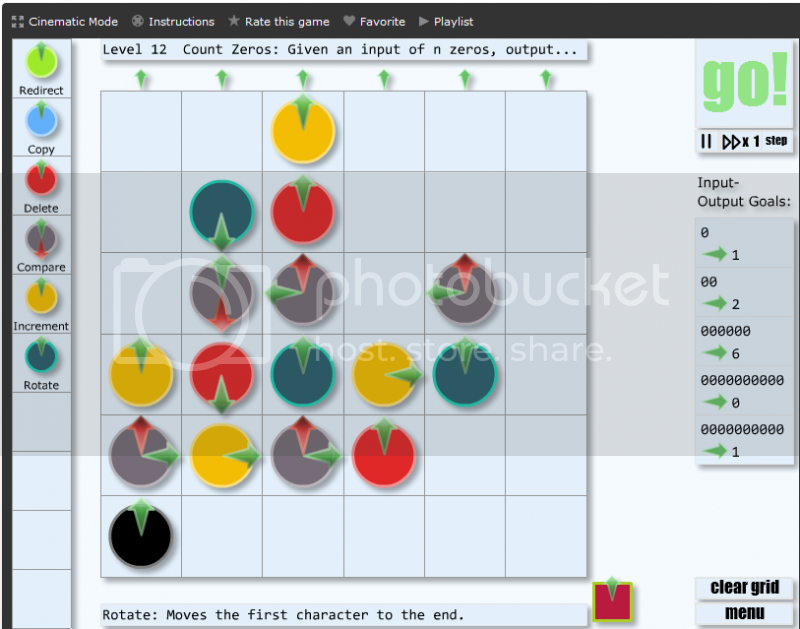 Play it in Sweep mode, which removes marked mines and adjusts surrounding numbers accordingly. Technically, the two are equivalent - if you can remember infinite detail, you can do the subtraction yourself, so Sweep mode adds no information. For us humans, though, the game is much easier when mines are removed, and I think it's actually reasonably necessary to do it to defeat a board. I can't win a single Small game on Classic, while I can take out a Small board on Sweep in 2 or 3 minutes. I think this is actually running into something fundamental that tends to render the endeavour either too trivial, or too hard. Remember the old 2D version, and clicking somewhere in the middle, and then having a circlish region in the middle of the board open up. You could always very easily identify mines that were denting the ring. I mean, if the ring had regions of convexity instead of all being concave, it was easy to push out and expand the known region till it was concave. Here, to get lots of regions that are concave like that you'd need the mines to be distributed as along some set of bubbles that are filling the region. Just uniformly randomly scattering isn't going to get the right sort of boards, whereas it does in the 2d case. What I'm saying is, after the board opens up a bit, using sweep, its very easy to identify mines that are on the boundary of unknown cubes, with just a single 1 next to them, and then you just keep pushing the known region open. So, there's a slower opening up, but after things are going in your way, it flows very quickly to the end, whereas in old minesweeper, it never really got into that trivial phase except right at the end. But here, it seems to have a very long phase of ease. If you made a whole lot of extra mines, you might avoid that, but then it would be too tricky. But it is very well done, and quite interesting. Actually a pretty great story in this game without having a lot of text. Just The Tip is very entertaining, especially with controllers on a big screen. You should have gone to sleep first. I looked at the puzzle last night, and it looked hard, so I went to sleep. This morning, I woke up, had an idea, solved it in 10 minutes with +10 box score and +9 step score, spent 5 minutes making a small twerk to get +9 box score and +10 step score, and 5 more minutes making another small twerk to get genius. Being fresh can help a lot. Did you use the exit blue option in your recursion? I did not end up needing it at all, but I'm wondering if others did, and if so, how they used it. I suppose you can't actually use it if your solution is correct in all cases. However, that means I can do it all again! Okay, took the time to redo all the levels. No, I didn't use the blue at all. There's no need, and I can't figure out how you even *would* use it. There's a lot of things that seem promising until you realize that you've still only got one entry point. Apparently the game just got updated, and the second exit from 19 was removed? skeptical scientist wrote: Apparently the game just got updated, and the second exit from 19 was removed? I'm pretty sure that the second exit is there iff there is an arrow that heads out in that direction. No, what I mean is the "Keep Unique" box used to have a green arrow and a blue arrow (so if you ever exited blue, you could direct that output separately from the main output). Now it only has a green arrow. This is true regardless of whether you have an arrow that heads in the direction of the blue side. Huh, I thought I'd caused that in my own game. It would be pretty weird if the creator actually just now pushed an update. If you can't find a compass, use the shadows of trees to find directions. The mushrooms are okay to eat, although sometimes they make you more hungry. No use of copy though. Free ASCII-art browser game, and winning does at least partly come down to just letting resources accumulate, but there's some skill in there too, and a lot more to the game than meets the eye. Magnanimous wrote: So many lollipops! I'm only at 2.5 megapops (Mlp) at the moment - having spent 4.4 Mlp on my last upgrade. Beat the normal mode and am now poking at hard mode. Reluctant to use berserk potions, but not sure what I can really do to progress otherwise. A fun little 10 minute game. you know, for joy division fans. or not. whatever. it's pretty interesting. Spent a fair bit of time over the last few days playing Dungeon Robber. It's based on something Gary Gygax came up with in 1979, but it's been slightly updated. Anyhow, you're an adventurer exploring a randomly generated dungeon. Kill monsters, loot treasure, try to survive. pseudoidiot wrote: Spent a fair bit of time over the last few days playing Dungeon Robber. It's based on something Gary Gygax came up with in 1979, but it's been slightly updated. Question, are your characters cumulative, so if I get 300xp on someone and they die, can I use anything from that on a new character, or do I have to get enough xp to change classes, and then I can get more? Nope! You start fresh every time. However, if you manage to level up you can retire and that character becomes a permanent fixture in town which makes further resources available -- more stuff to buy in town and more class options when starting. Ah ok, so I need to retire alive with a minimum of 1k xp to make any progress, gotcha. Yes, please. It's interesting, but it means I constantly get false hope for a new game when it's just y'all being chatty. Impetus is a really cool game, even though (and because) you can't play it anymore. http://www.kongregate.com/games/CoreSector/ghost-hacker TD - tower have 2-4 upgrade slots with different colors in which you put a upgrade of the right color. Upgrades a quite significant (any power can have slow, extra target, bounce(yeah bounce+ extra target=4 times the fun), store 5 attacks, etc. ), but once a tower has full slots there are no further upgrades for it. You can move towers or sell them for 100% of their cost. The level are short but challenging and for once I actually have to adapt to the level in a td. There are spells/scripts, but you actually get the money you pay for them back after a short while. And it has a (super simple) story. PeteP wrote: http://www.kongregate.com/games/CoreSector/ghost-hacker TD - tower have 2-4 upgrade slots with different colors in which you put a upgrade of the right color. Upgrades a quite significant (any power can have slow, extra target, bounce(yeah bounce+ extra target=4 times the fun), store 5 attacks, etc. ), but once a tower has full slots there are no further upgrades for it. You can move towers or sell them for 100% of their cost. The level are short but challenging and for once I actually have to adapt to the level in a td. There are spells/scripts, but you actually get the money you pay for them back after a short while. Also nice is Bubble Tanks Tower Defense 2, where all towers start out the same then branch out into different niches. If four fully upgraded towers are next to each other, you can buy a Mega Tower that combines all their characteristics. If four Mega Towers are next to each other, you can make a Mega Mega tower.